The Appassionata series is the most detailed account of the principal experiences in the life of Salvatore Zofrea, focusing on his birth and early life in Borgia, Southern Italy, his migration to Australia, his travels, maturation as an artist, family, personal relationships and friends. 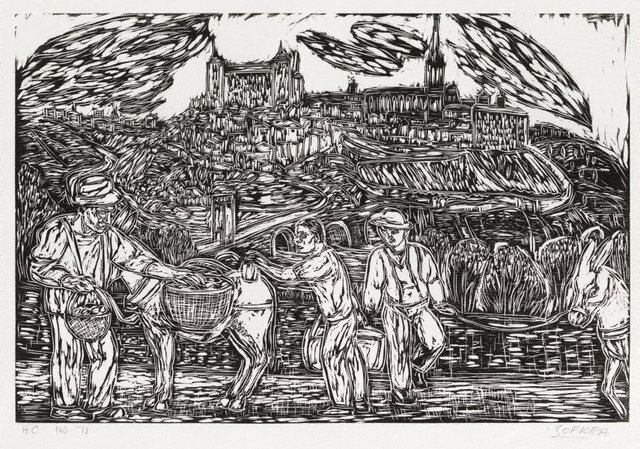 Zofrea is one of the finest exponents of woodcut in Australia. His work as a painter and printmaker is inextricably linked - his woodcut prints have been influenced by his work as a painter especially in the richness of their texture, composition and ambition, as has his painting by his activity as a printmaker - his paintings have become simpler in expression and design since he has been making woodcuts. The series is in an edition of 14 with 6 artist's proofs, four of which are on Japanese paper textured by the wooden boards on which the paper is dried after couching.